Nothing that lives on this third rock from the sun can survive without water. Water is the one thing that we all have in common. We can’t live without it and when we don’t have it we lose our minds. Perhaps this is why water features in landscaping are so calming. It must be some subconscious understanding between our mind and the earth. Whatever causes the calming effect, it can be achieved with a water feature in your landscape. Over the years I have had the pleasure of working with and getting to know thousands of wonderful people. While we are on the cutting edge of design, plant materials, and technique there eventually becomes a time when things need to be freshened up. A client that I have worked with since 1987 called for just such an update. They removed the deck in their yard and were looking to relandscape the area. Who has ever heard of a pondless waterfall? They are an alternative for the water garden lover. How many times have you hemmed and hawed about getting a pond? Perhaps you have thought, “I don’t want a pond because of standing water”, “I have a small child and think it is too dangerous”, or “I don’t want to take care of fish.” A pondless waterfall is a substitute for those who may be anxious about getting a pond. Basically, it is just another way to create a waterfall and stream without the traditional holding pond. Instead, a deep hole is dug and water cubes are installed. The cubes provide a reservoir so that the pump has enough water to pump at all times. The hole is then packed with rocks and gravel and finally filled with water. The water is then circulated from beneath the rocks and gravel by a pump that sits at the bottom of the hole, pumping it to the top to the water rock or waterfall where it is re-circulated into the reservoir. Since the water level never pools up above the level of the rocks and gravel, it gives the appearance of a pondless waterfall. 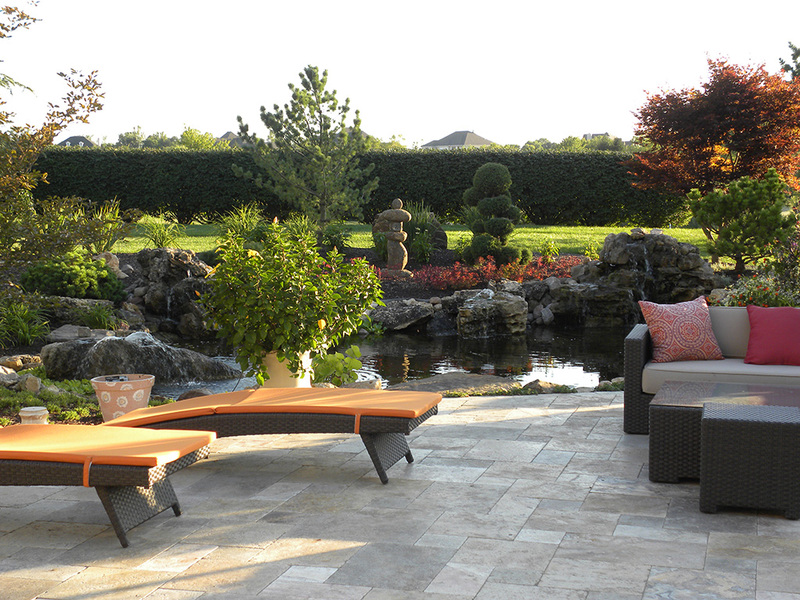 The owners wanted to create a backyard entertainment area for family and friends. Privacy, pool, outdoor kitchen, water features, fire pit, fishing, multiple seating areas and lush, colorful landscape areas were all very important. Crafting this design combined the needs and personal style of the client along with functionality in an aesthetically pleasing space. Challenges were many. The house is situated on a 1300′ deep lot that is only 110′ wide, with one narrow access to the rear yard. The septic system could not be relocated forcing crews to work around it as well. An existing five acre pond was too shallow to support fish, which the owners wanted to add. As project manager, we coordinated the installation of the pool, adding a new 400 amp electrical service, subpanels, and larger gas service. We buried thousands of feet of conduit, water lines, gas lines and drainage throughout the property. A gourmet, covered kitchen with built in heaters was built as a focal point to the backyard linking with the architecture of the home. Providing entertainment opportunities, a stereo system and lighting were also included. We began by clearing the front of the property. The existing edge of the pond in back was dug out. This provided a place for fish to be added. The clay removed from the pond was reused, by hauling it to the front to raise the grade by three feet. This eliminated the current drainage problem. In addition, 3000 yards of clay were hauled from the site. The next challenge was to create a waterfall with views from three sides. The design was to have a 60,000 gallon waterfall flow towards the house and another 30,000 gallon waterfall flow to the pond in back. Smaller streams alongside were incorporated as offshoots to the main falls. This created a beautiful multi-sided view from the property, providing unity and balance converging as one. Landscaping started with the installation of privacy hedges, creating an outdoor room atmosphere. Landscaping plantings were strategically placed to cover pool equipment and pumps used in the running of the waterfalls. Over 300 tons of moss covered boulders were utilized in this project. We also designed and built our own intake stand for the pump screen to keep them off the pond bottom. This prevented debris from entering the falls and streams. When the owners of Chicago Decking, Inc. wanted to provide their employees with a relaxing open space, they were fortunate to have a blank canvas to work with. 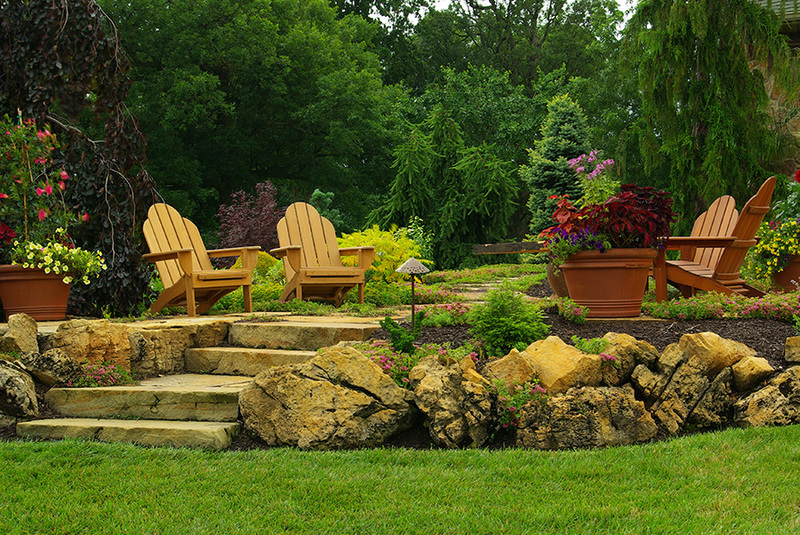 Nancy Marshall of Small’s Landscaping and her team turned the open space into a private retreat complete with a waterfall, fire pit and extensive trees and colorful plantings.